It’s great news that I ended up $15 under my $400 budget this month. Whoo hoo! Netted to the January slight underage and February overage, I’m still ahead by $2! I was very pleased with our dining-out budget. We went out 5 times, but really kept it cheap! There were two bulk purchases, Amazon’s subscribe & save tuna and three 2lb bags of shredded coconut from Tropical Traditions (which by the way is scrumptious!). Plus a half bottle of fish oil (split with the dog budget). All totaling about $55! Taking that into account, it really was an awesome month! My summer canning and freezing is paying off. There’s been no need to purchase any jelly/jam yet and I’m hoping to can a few jars of citrus marmalade soon. My tomato stockpile is plentiful, and still should be enough until next tomato season. I popped open a jar of my home-canned corn salsa, and it was absolutely delicious. I was hesitant to can additional salsa recipes because when I initially tasted this batch, it was over-the-top too vinegary; it must have mellowed over the months. We go through about a jar of salsa every week, so to be able to can my own, is thrilling. 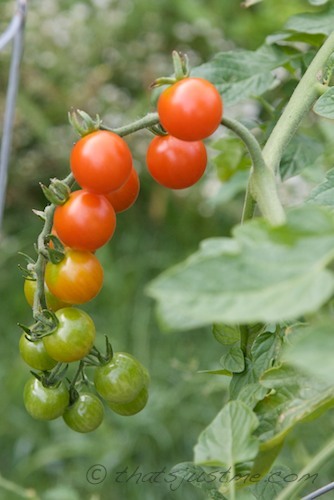 I’m looking forward to next summer when tomatoes are abundant! I’m already getting some tomato salsa recipes organized!